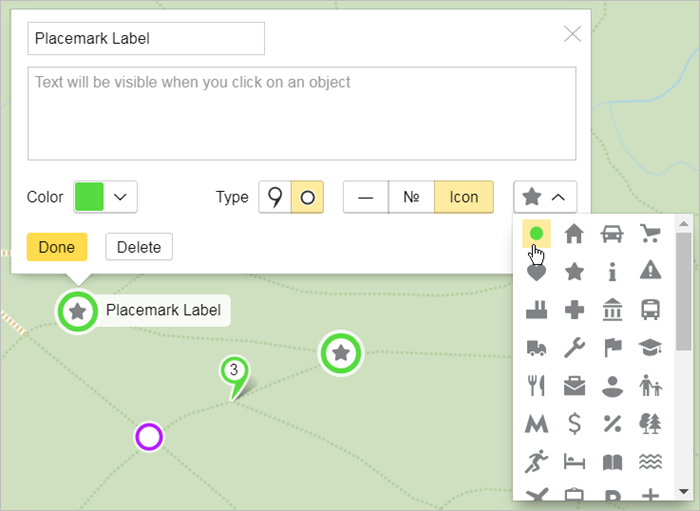 Click Done, and the placemark will be saved on your map. Lines — set the color, transparency level and width. When you've finished drawing the line, left-click on the last vertex and select Finish from the context menu. Click Done, and the line will be saved on your map. You can also simplify a line automatically (see below). Polygon — set the colors and transparency levels for the outline and background fill, as well as the width of the outlines. You can add an internal polygon (i.e. another polygon inside the first one). To do this, left-click on any of the polygon vertexes and select Add internal outline from the menu. If a line or polygon contains more than 1,000 vertexes (in other words, it exceeds the technical limitation), you can simplify the item automatically. Just left-click on any of the line or polygon vertexes and select Simplify line (or Simplify contour) in the context menu that appears. When you simplify vertexes, the extra ones are deleted in such a way as to maintain the overall appearance of the item. Draw the outline, left-click on any vertex and select Finish from the context menu. 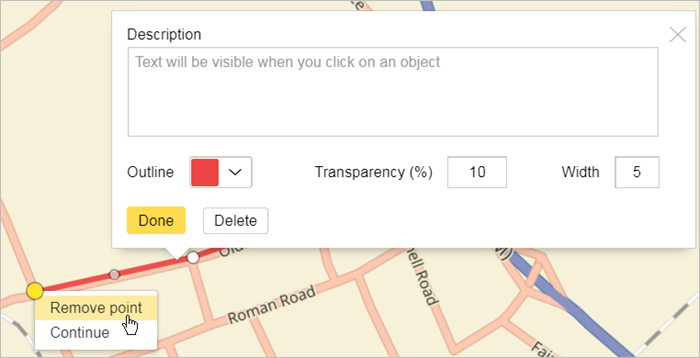 Click Done and the polygon will be saved on your map. In the Description field you can enter text that will display when you click on that item. When you create a map, you can copy and insert a selected item using keyboard shortcuts. 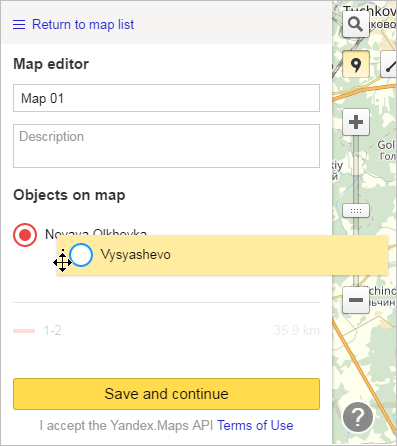 As you create your map, you can undo or redo actions using or keyboard shortcuts. These operations are available during the creation process. Additionally, you may be able to access these operations after you save your map if you return to edit it at the map type selection step (see Select map type and get code or link). If you closed the browser tab where you were creating your map, started drawing a new one, or chose a different map from the list, then the operations will no longer be available. When you've finished editing the item, click Done. You can also delete the item. To do this, click Remove. All your map items display in the Map editor toolbar as separate lines in the items list. Every line includes the item's name and a preview. Line items display their lengths (which are calculated automatically). Items in the list are displayed in the order Placemarks → Lines → Polygons. 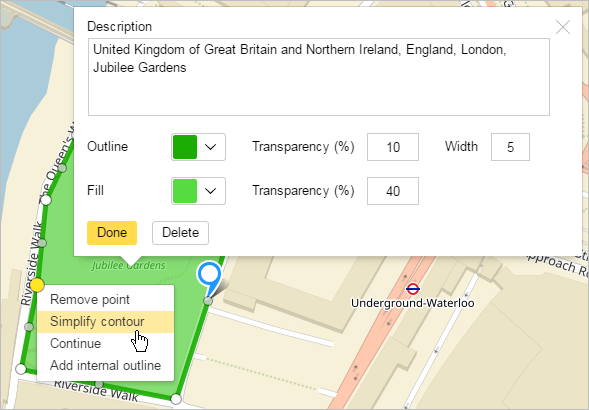 Items are displayed on the map in the same order: placemarks are displayed “higher” than lines and may cover them. Likewise, lines are higher than polygons. While it's not possible to change this order, it is possible to change the order of how items are displayed within each category by moving the appropriate placemark (or line, polygon) to the foreground or background. To change the order in which items are displayed, drag a line from the list to the appropriate position (or use keyboard shortcuts).